Scores are in! Click below for the official results. Congrats to the Deerings for the overall win from the PRO class! Another Pumpkin Run is over and from the comments I received, it was a good weekend. I enjoyed seeing everyone as I raced from the start line to pit stops and lunch stops and then back to the finish line. It’s always a hoot watching Dana Sharp wheel that Hudson around tight corners and curves. 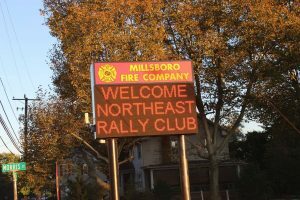 Thanks to everyone that joined us and our sponsors, we were able to donate $6,500 to the Millsboro Fire Company and give the Millsboro Police Department $500 for their Needy Family Fund. THANKS! THANKS! I do have a correction to make. I found out the Hershey Car Show and Swap Meet is the weekend that we planned to have our rally. Because so many members of our rally family attend the Hershey event, I was able to change the 2018 Pumpkin Run to October 19-21, 2018. Please make a note of the date change. I want to thank Doug Sharp for becoming President of the Northeast Rally Club and I thank everyone for supporting me for the last 17 years. Also, I want to thank Joe Roche for handling our website www.northeastrallyclub.com . I hope everyone has a healthy and safe winter and that you will join Howard and Doug in Fairport, NY next May for our spring rally. It’s summer and fall is coming, time to get your rally shoes on. The Pumpkin Run 2017 is almost ready to go. Jim Feeney is entering the instructions as I send this letter and entry form. I have enclosed an entry form, but they can be printed from our website (thanks Joe Roche) www.northeastrallyclub.com. I have blocked a number of rooms at the MICROTEL by Wyndham in Georgetown, our host hotel for the last two years (302-858-5111). They have another function the same weekend so if you plan to join us, make your reservations now and ask for the NORTHEAST RALLY CLUB rate and also ask about their cancellation policy. They are holding our block of rooms until September 15th. Another Great Race is now history. If you attended last year’s Pumpkin Run you will remember this year’s winners. Beth Gentry and Jody Knowles were the overall winners with Beth’s daughters (also ran in the Pumpkin Run) winning the Rookie Division. There were many from the Northeast Rally Club entered in this year’s Great Race and I have listed them on page 2. Again, if you plan to join us in October, please return your entry form as soon as possible. If you have any questions, please call me (302-934-1246) or email me at rhb19966@verizon.net. Enjoy your summer and mark your calendar now for the 17th annual Pumpkin Run. Welcome to the official 2017 NERC Pumpkin Run! We have lots of great times ahead. Please register ASAP to make sure your spot is reserved!